High school student Elle (Joey King) has been best friends with Lee Flynn (Joel Courtney) since birth. They bond over dance competitions at the mall and from the time they were six, have lived by a set of rules that define their friendship. One of the rules is that relatives are off limits as far as romantic interests. However, as Elle matures, she grows increasingly attracted to Lee's older brother Noah (Jacob Elordi), despite his image around school as a player and his tendency to get into fights. 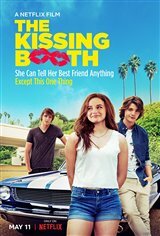 When she realizes he may just feel the same way about her after an incident that takes place at a charity kissing booth, she has to figure out if it's worth risking her friendship with Lee.